Paula Damasceno is a Brazilian visual artist, born in Rio de Janeiro in 1975, and based in Greensboro, North Carolina since 2012.Her practice explores photographic processes, and their relationship to history, memory, and identities. Her work addresses and investigates cultural codes, heritage, transculturalism and Humankind. Paula was awarded a 2010 artistic residency at La Casa del Tunel, in Tijuana, BC Mexico, where she received the Artistic Mobility Award. In 2012, she was selected to participate in an artistic residency at Elsewhere Living Museum, Greensboro. Paula is a recipient of the 2017 Hellena Huntley Tidwell and Isaiah Tidwell scholarship award to participate at Penland School of Crafts "Wet Plate Pic Nic" workshop led by Dan Estabrook. In 2018 Paula was a recipient of The Light Factory Throwdown Portfolio First Place Award for her portfolio Offerings, and obtained a Bachelor of Fines Arts degree with a concentration in Photography from the University of North Carolina Greensboro. In 2019 she received a Society for Photographic Education Student Innovation award. Rafael Soldi: Hi Paula, thanks for taking the time to chat with us. RS: Tell us about your background and the paths that have led you to your current explorations. PD: Ok. I will make believe here that it is all linear, but in reality, it is not. I was raised in a home of history, arts, and crafts. My childhood and teenage years were filled with historicized political analysis, music, ballet, samba, folktales, books, anthropology... Also with the seam, textiles, fabric, threads, colors... At the same time, I had this incredible curiosity and resourcefulness about the record player, the VHS player, the cassette player, I loved them even if no one in my house had much intimacy with them. So, I think in my artwork I keep going back to the encounter between my environs’ information and my own curiosities. After studying and becoming an actress for ten years or so, I realized that the field was not providing me what I needed beyond the expansion of my human empathy, for which I will be forever grateful. It was also during this time that I participated in the liturgy of African Brazilian religion that became one of the themes of my current work. I then started to work at a documentary production company in which I learned how to shoot, edit, produce, and to think about the historical documentary. I became a freelance editor and director and had the chance to document and edit images of several events of Africa Brazilian liturgy. This experience recorded in me some of the impressions I am exploring in the present days. At some point, I decide to explore the theme of the traditional movie theaters just because I missed them. This theme rendered a project made in an artistic residency at La Casa del Tunel in Tijuana, Baja California, Mexico, then a project with at-risk youth in which they explored their neighbors’ memory of the old movie theaters in Salvador, Bahia Brazil. Ultimately, in 2012 I was invited to participate in an artistic residency at the Elsewhere Living Museum, in Greensboro, NC, in which I completed a project about the local old movie theater. Unsatisfied with the documental narrative and the forceful make-believe of the image in movement, I decided to pursue alternative ways to manifest and express myself. I pursued a BFA in Photography at the University of North Carolina Greensboro. After my graduation, I decided to pursue a Dual Master Degree in Library Science and Art History at the University of Chapel Hill, where I am right now. I am marrying my studio practice with art history and archives, art with craftswomanship, mechanical and analog to digital forms as a strategy to visually express new problems, elaborate counter-narratives and deconstruct assumptions. RS: I’d like to expand on your current project—Offerings. Let’s begin with some conceptual framework for this work. Each piece in the series features two contrasting panels: on the right we see a tintype and on the left an abstract drawing. The tintypes picture yourself, guided by the rituals and liturgy of the Transamerican African Diaspora of the 19th century, as if a conduit for your ancestors in melancholy tones of black and brown. The colorful abstract motifs opposite the tintypes are akin to flags, based in Western African patterns and traditions. These stand in contrast to the tintypes, almost as if they set forth a proposition for an Afrofuturism colored not by the stain of the Atlantic slave trade, but by the energy and prevailing spirit of Western African spiritual practice. Let’s begin there—tell me first a little more about the content of the tintypes, what are we looking at? PD: We are looking at a work which conceptual framework is determined by a series of juxtapositions. Visual estrangement, amusement, pictorialism, modernism, objecthood, are imbricated in the diptychs. On the right side, in the tintypes, we are looking at a melancholic composition where an elusive body manipulates, holds or relates to food, flowers, candles, and booze. Each image evokes the Transamerican African Diaspora liturgy brought to the three Americas through the Transatlantic Slave Trade in the 19th Century, and in which people offer those things to their deities. Each tintype corresponds to a thing offered to an specific deity: Ossosi, Sango, Esu and so on. The tintypes are really a result of my own reflections on the wet plate process used either in daguerreotypes or tintypes and how they were at first the colonial medium of typification, objectification and visual subjugation of enslaved people, looking at what Carrie Mae Weems did to Agassiz's archives in her From Here I Saw What Happened and I Cried and figuring out what I wanted to say. And I wanted to produce new archives, not to uplift the archive of slavery, nor to negate it but to add to that collection an apparently invisible, erased aspect of African Diaspora that is very much alive nowadays from New York all the way to Rio de Janeiro and beyond: the worship of the Orisas. RS: You have a history with theatre and ballet. Do you only see these tintypes as the final images, or are they a record of a performance, too? PD: Yes, I can say that I am performing a non-performance, a negation of my—or anyone’s—body as a strategy to avoid reproducing colonial stereotypes. The body—my body there—is formally pointing out to a collective subjectivity: the Transamerican African Diaspora liturgy. My focus is on the offerings and how the body becomes devoted to the offering to the point where it can be in soft focus, as an ethereal representation of itself. Even though the offerings occupy a smaller portion of the composition, they are the great circular sacred shape that makes the missing part of the slavery archive. RS: Let’s return to the abstract drawings. Why is it important for you to make this pairing? What function do these new forms serve for you and how do they inform our reading of the tintypes? PD: There are a plethora of functions for the abstract drawing. I guess the most immediate visual function is to provide colorful relief, geometrical balance, and historical estrangement. They are also a reflection of the design my grandfather used to make to the leather bags he sold that are much related to Brazilian concretism. Ivan Serpa, Volpi, but most of all Rubem Valetim, who smartly connected the invisible thread that exists across geometric abstraction, popular culture, and African art and diaspora. So, there is a question on art history/modernism and history/colonialism…can the former be without the latter? RS: The tintype process itself is carefully chosen. Why is it important to employ a 19th century process to reclaim the picturing the African Diasporic psyche and afrotropes. PD: I think the offerings as afrotropes are more rarified than the African descedant body. Of course, when people of color are shot and killed by the police by the thousands or sent to jail by the hundreds of thousands, the body easily becomes a battlefield, a canvas, a target, an afrotrope, and it should. But what I did with the tintypes was first to visually escape the body objectification customary of the colonial archives. Second, I added Western Africa cosmology to create a new alphabet, a new visual code, one that couldn’t be made only by the tintypes, but where the tintypes are the opening sentence that dates back to the 19th century, the attack—to borrow from the vocabulary of music—that enunciates the tone of the phrases in the text of the work. RS: Continuing to unpack the formal choices you’re making. Let’s talk both about the Iroko wood cases—which you described as “imperfect” and “housing a problem”—as well as the pillow cradles, which allow the weight of this “problem” to rest comfortably while also infiltrating questions of fugitivity and Blackness into the conversation of institutional ownership. PD: Iroko is a tree and a deity of ancestry in Western African liturgy. A big tree where these offerings would traditionally be placed. A tree through which the divine connects to the mundane. A tree used as interior design flooring material in the U.S.
That’s a perfect material for imperfect cases. Cases that negate in material and shape the cases made for 19th-century ambrotypes and tintypes. In fact, they are diptychs, they are not united, they don’t close, they can’t be possessed and privately fetishized in the same way as the 19th-century ones. Their content lives in openness. So I have made them thinking on how to house all the juxtapositions/problems presented by the tintypes and the abstract drawings put side by side and yet let these problems rest a certain space, a space of institutionality. Used as a prop in special collections, the velvet cradles both reflect on and are a reflection of the institutional spaces that served and serve as repositories of the archive of slavery. But also, their function is to provide a non-resistant, bling, shiny protection to Iroko cases and their content. I don't want to settle these problems, rather I want to preserve them as problems of the institutions of art/history. These problems of colonial visual subjugation, modern appropriation, objectification, ghettoizing labels that I attempt to scape. And scape and fugitivity don’t have to be successful, they just need to exist to be threatening. RS: Speaking of institutions. We recently chatted about this idea of artists working with archives. About writing a new history in an old medium to create new archives. I know Carrie Mae Weems is important to you, and I recently learned about other efforts in this arena, including the Getty’s African American History Initiative and The Waheed Photo Archive. Can you talk about your interest in archives? PD: It really comes from early age been tailored to think about history at all times. And archives are this fascinating point of departure for that. I was always struck by photographs made in the 19th Century in Brazil, and always looked at them acknowledging their sorrow but also with a sense of ancestry, not only African ancestry, but other immigrant populations’ ancestry as well. So I think the sorrow is there, as a result of the historical context in which they were taken, but we can also educate our eyes to see beyond a binary reading where an image of a native person means an image of sorrow and an image of a white person means an image of power. Moreover, the strategy to not use the wet plate alone is my decision to explore other aspects beyond dualisms.That is the same reason why I do not use words in the Offerings, to not allow them to be an archive that determines its reading by the use of literary codes. I look to these archives an love them as they are now, I wonder what Mae Weems would add to them, and I wonder what other artists could either add or subtract from them to manifest their own reflections. One thing that is going on right now about archives that interest me is the lawsuit against Harvard by people who claim to be the descendants of one of the enslaved people photographed by Harvard biologist Louis Agassiz in the 19th century. There is a very fair article in the New York Times written about it that a professor of mine told me about. RS: It can be complex to negotiate making your work in a world mediated by the White Establishment. We’ve discussed the lack of scholarship, awareness, and even basic language around discussing non-western concerns. Without a reference point, curators often center Blackness around pain instead of a more nuanced look at the issues at hand. What has your experience been? How important is it for institutions to employ curators and staff who can help contextualize the stories of the Transamerican African Diaspora, for example? PD: It is important for their own survival as relevant institutions. I am not concerned here with numeric, representational reparation, although I am not against it. I am here saying that if an institution in 2019 doesn’t have a multicultural body of professors, curators, staff, it is not only that there is lack of cultural humility but that there is lack of relevance, quality, and trustability in these institutions and their exhibitions, archives, classes and services they offer. In my case, I have had 90% of my experiences in a set where professors or reviewers had no knowledge whatsoever about Rubem Valentin, Mario Cravo Neto, even Lorna Simpson or Statch Hoyt! And so their comments and evaluations really came from a place of ignorance, and at this point (but not at all times) all the academic, scientific and artistic value of the institutions I was in went down to a three in a zero-to-ten scale. RS: In your statement, you set your work against the backdrop of Rubem Valetim, Mario Cravo Neto, Carrie Mae Weems, and Satch Hoyt. What strategies are you borrowing from them, and how do you fit into this tapestry? PD: Mae Weems simply taught me that the archives were there to be manipulated, and my response was “Okay, so archives can be newly made as well.” And so I did. All aesthetic decisions were also made through an exhaustive negotiation with the archive of slavery and the modern works of Pierre Verge and Jose Medeiros and the work of Mario Cravo Neto. Photographers whose work is about this same liturgy. I wanted to take Cravo Neto back to pictorialism, I wanted to take Verger and Medeiros in a twisted ancestral trip and look at their materials adding more complication beyond transcendental aims of Mario and the documentarian and uplifting aims of Verger and Medeiros. I also wanted to take this visuality out of the magazines and walls and put them into objecthood, inviting the audience to curve over the diptychs and be more active in there seeing as people have done looking at Satch Hoyt’s From Mau Mau to Bling Bling. Hoyt’s Mau Mau also provided me some lineage in terms of creating a compact device for storytelling. Only my story approaches a larger geographic area. PD: I am designing an exhibition of my work where Offerings will be at its center accompanied by two other works. One a series of light boxes made from The Nucleus of Us All series of photograms that will have each a glass bowl at the bottom with different levels of Atlantic ocean water in them. And the other, the documentation of a performance where I wear a piece made of four hundred photographs transferred to one-inch squared pieces of Iroko wood. The process of choosing the right collection of picture began with myself, my family members, our names, the names of my ancestors and then expanded to other families with the same names, same birth locales, some historical figures that I think are in me and in other’s souls. All the images have their eyes erased, making each person unidentifiable in the first place, and as I spin, the images and my body become one blurred shape, challenging the idea of individual ancestry. Omolu (Offering series, 20017 - 2019.) Tintypes, heated press print, Iroko wood, velvet cradle. Esu (Offering series, 20017 - 2019.) 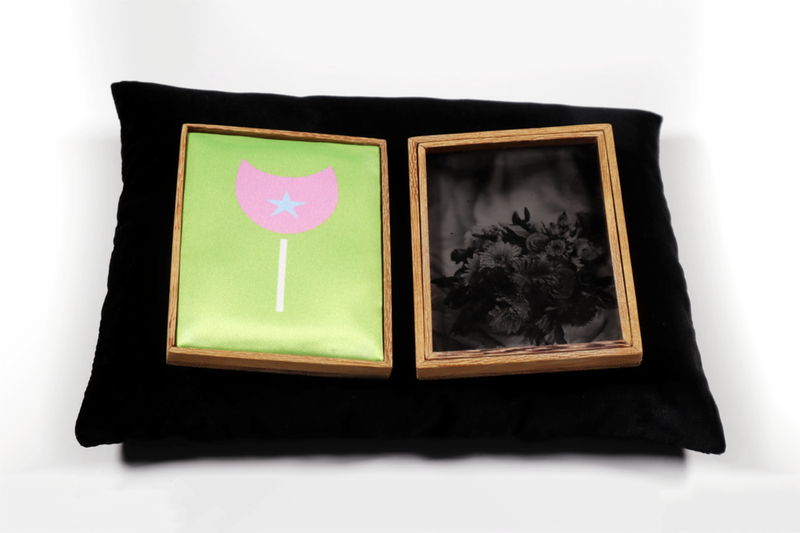 Tintypes, heated press print, Iroko wood, velvet cradle.